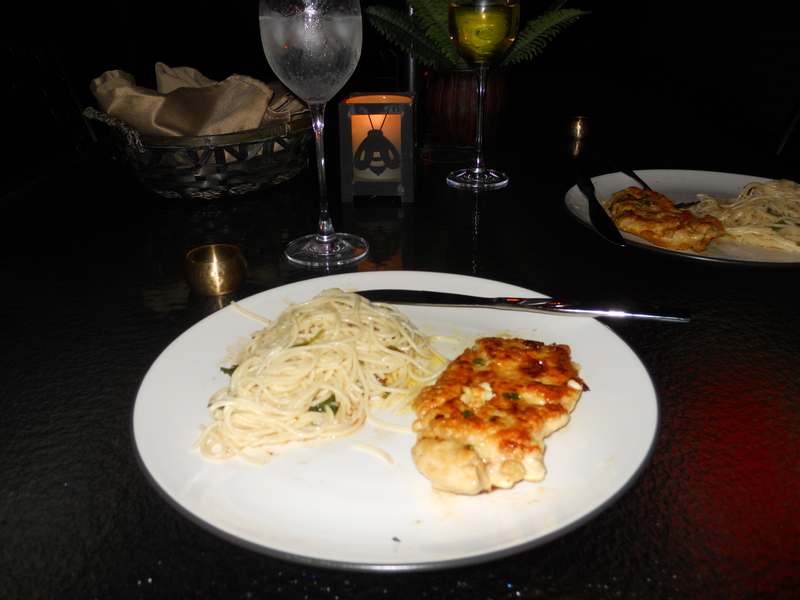 Yesterday I posted a basic chicken piccata recipe. This is a dish I’ve made many times and this past Saturday I made it again. And…since weekends I am more lenient with what I eat and drink (what Dr. Oz calls “Faturday”….love that term!) I decided that I would indulge in some as well. To turn the recipe from full fat to slimmed down, all I did was modify the amount of oil and butter, as well as cut back the amount of flour and parmesan cheese. 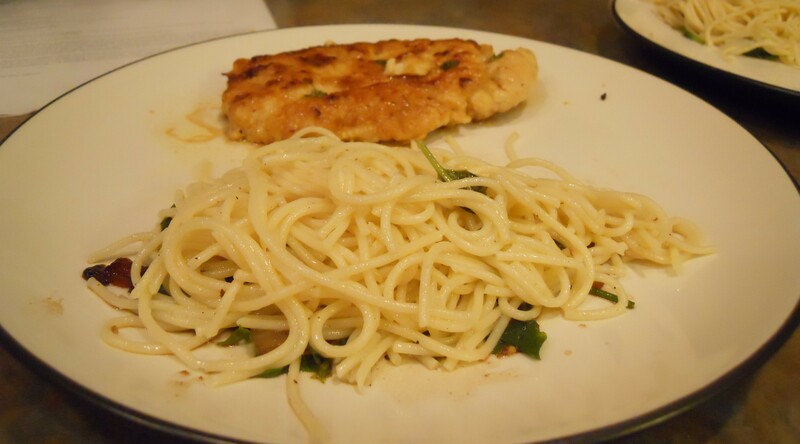 My modified version is 8 pointsplus (Weight Watchers)…and let me tell you…it was SO GOOD! Even the Hubby enjoyed it and didn’t know it was “slimmed down” (until I told him, of course! 🙂 ). It tasted just as good as the original version, if not better because it didn’t have all that heaviness that comes from a lot of oil and butter. One thing I would recommend with the slimmed down version, however, is that for the sauce you should start with the juice of only one lemon (or 1 tbsp. lemon juice) and allow it to cook for a few minutes. Then taste it as you go to see if you need more. One problem I did encounter was that it was a bit tangy from too much lemon (but it still tasted awesome!). Probably because it didn’t have as much butter as the original recipe to cut the tang! 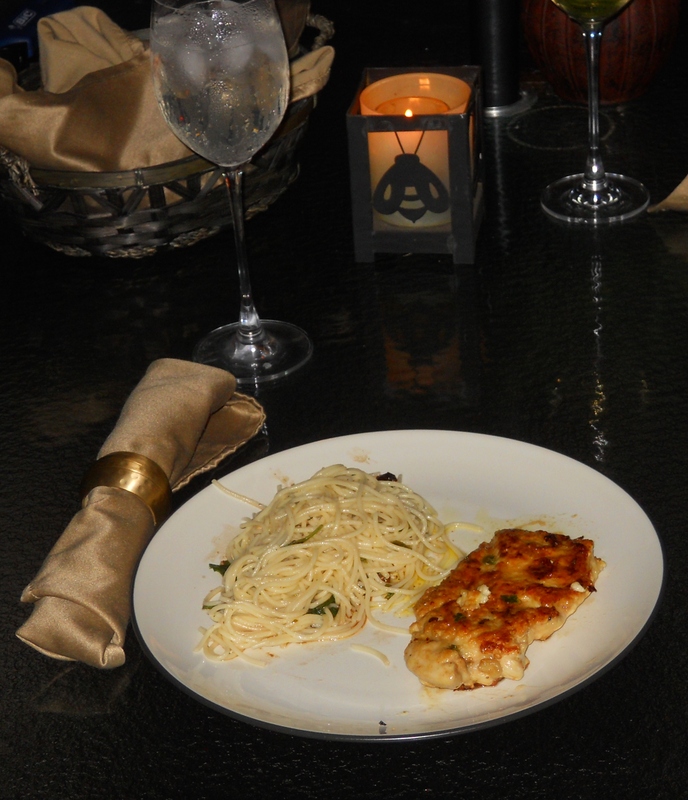 Be sure to check out yesterday’s post “Chicken Piccata” for some more tips on how to make this dish even more delish! Prepare the chicken by cutting it in half lengthwise to make two filets, approximately 5 oz. each. Pound each piece to 1/4” thick, using a meat mallet, rolling pin, or bottom of a heavy pan. Sprinkle both sides of meat with salt, pepper, and garlic powder. In a shallow dish or plate, combine the flour and parmesan cheese. Heat the pan over medium heat and add the oil. Allow oil to get hot. Dredge the chicken in the flour/cheese mixture and place in the pan. Cook for 4-5 minutes and flip, cooking until the chicken reaches an internal temperature of 180 degrees. Once the chicken is cooked through, remove it from the pan and cover it with foil to keep warm. Using the same pan, add the wine, scraping up any bits of meat that may be stuck to the bottom. Add the chicken stock and lemon juice. Turn heat up to medium high and allow sauce to reduce, stirring occasionally. Once the sauce has reduced to your preference (remember the longer you reduce the thicker the sauce…but don’t reduce too long or you won’t have enough sauce for the chicken.) remove from heat and swirl in the butter until melted. Stir in the parsley and capers. Pour the sauce over the chicken (I used 2 tbsp. for mine, and poured the rest over my hubby’s) and serve.